BBQ Chicken Salad. Probably one of my favorite salad combos ever. Ranks right up there with this one. Oh and this one and this one. Gotta love a great dinner salad. For the salad, combine the cooked chicken and BBQ sauce in a medium bowl. Refrigerate until ready to use. In a large bowl, toss together the iceberg lettuce, romaine lettuce, red onion, cilantro, corn, black beans and cheese. Toss the mixed salad with about 1/4 to 1/2 cup of the dressing, if desired. Otherwise, you can serve the dressing on the side. Place salad on plates and top with the prepared BBQ chicken and additional dressing. For the dressing, combine all the ingredients together and whisk (or shake, if using a jar) vigorously to combine. You could also run this through a blender to make it even more smooth. Refrigerate until ready to serve. This recipe calls for already cooked chicken so plan ahead! I like to cook my chicken in the crockpot, using frozen chicken breasts and about 1 cup of chicken broth for every 2 chicken breasts. I cook on low for about 4-5 hours and then shred and refrigerate (or freeze) for later. Make Ahead Instructions: All the components of this salad can be prepared up to a day in advance (the dressing can be made up to 3 days in advance). Store separately in the refrigerator and toss before serving. I just use a whole store rotisserie chicken. 2 cups of sauce is perfectly enough. For people saying 2 cups bbq sauce is too much. It would be if you are eating it as is, You want the chicken saucey in the salad though. Plus the chicken soaks up some while in the fridge. Once it’s on the salad mixed with everything else it is not too much. I love this recipe. Have made it for years now. Thank you!! This is AMAZING!!!! I usually don’t dare make salad as a main dish cause I know it doesn’t thrill my husband but it made my dinner time awesome!! I loved everything about the salad. I did omit the red onion…cause yeah, I just don’t like ‘em. I added thin crispy tortilla strips for salads. I am already excited for lunch leftovers tomorrow!!! Thank you so much, Jen! This is an old recipe but still one of my FAVORITES. So happy you loved it! We love your recipes, thanks so much for sharing them. We’re not fans of cilantro. Can it be omitted without drastically changing the taste of the dressing? Do you have a suggestion for a replacement herb/spice? Thanks for your time! Sure, you could leave it out or sub in parsley! You have mentioned before that you sometimes sub kefir for buttermilk in your backed goods. Would it work in this dressing? Just made this, and the dressing is fabulous!!! I even used fat free mayo, and it didn’t hurt the taste! This salad is so versatile! A couple of nights ago In a pinch, I didn’t have a dinner plan. But I had made this before and had leftover dressing from a month ago. I threw breaded chicken patties from Costco into the oven. I used what I had on hand for the salad and what I thought would go well with the dressing since I didn’t have red onion or iceberg. I used half spinach and half romaine, a can of black beans drained, a can of corn drained, 1/2 a yellow pepper, tomatoes, and green onions. Everyone raved about it and loved it. I had a little leftover salad and we ate that tonight as a side salad without chicken… my husband can’t stop saying what a great salad it is. Thanks again! This will definitely be in our regular rotation and I’ll keep the dressing on hand for nights when I’m in a pinch since that worked so well just to throw cut up chicken on top (but love the BBQ chicken too)! Thanks for another great salad Mel!!! I made the Thai Chicken Salad and my family loved that one too! Can’t wait to try another of your wonderful salad creations! This salad is delicious! I’ll definitely make it again. The dressing is amazing and I could eat it straight… I can’t believe how good it is… it doesn’t seem the combination of ingredients would impart as sweet a flavor. I will make this dressing often. Also, I love that wish bread this is a complete meal with plenty of veggies and a good, lean protein. Thanks! I will review later this week… but I want to say the 2 cups BBQ sauce to 3 cups chicken is so saucy that I added another cup of shredded chicken… and it’s still very saucy (I’ll try it like that)… going to make the dinner later this week. I appreciate your recipes this is the second I am trying. The Honey Lime Enchiladas were a big hit… thanks a bunch. Oh no you put 4 times the amount of bbq sauce! Oops!! How did she use 4x the amount. It says 2 cups. 2 cups of bbq sauce can’t be right. Divine. My 18 yo, skinny girl, could not get enough. She finally had to walk away from the table. She left out the purple onion, but I thought the onion put it over the top with flavor. We subbed parsley for cilantro because the same said skinny girl won’t touch the stuff anymore. The dressing was still wonderful. So glad I gave this one a whirl. A great Saturday lunch for the hard working family. I made this for my family tonight and it they loved it. I set it up like a salad bar, so that they could customize. My mom can’t have raw onion, my daughter would not be caught dead eating beans. I added all of the ingredients to mine. What a fabulous taste and texture combo! This recipe is definitely a keeper! This was a fantastic meal on a warm evening. The flavors really go quite well together. I always like a little crunch in my salad so next time I will get those thin tortilla strips in the produce section to add as my “crouton” or maybe sunflower seeds. I looked for honey BBQ fritoes as one commenter suggested but couldn’t find them….they probably don’t make them anymore. 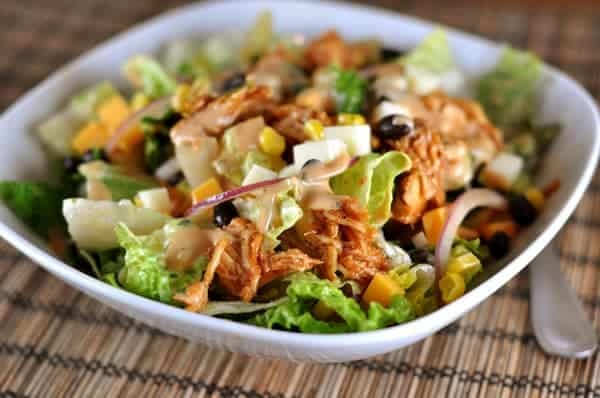 I used the Slow cooker BBQ chicken of yours and it was yummy…next time I will shred half the chicken for sandwiches and dice the other half for this salad….LOVE getting two meals out of one dish! Also, I served the copycat red lobster garlic bisquits with this and they complimented the salad very nicely. Thanks for a hearty salad recipe! Another win Mel! This was super easy to make and my whole family loved it. I forgot to add the garlic in the dressing but it didn’t impact it all that much. Plus, I can sit next to people after eating this yummy salad. Thank you for your note on cooked chicken…..I always see that and wonder what the best/easiest way to make it! Love you recipes! This dressing is to die for! I made it with mostly greek yogurt and a little mayo to lighten it up and it was still amazing! Thanks for a great recipe! I just made this today. It was out. Of. This. World. Good! Seriously better than any BBQ salad I’ve ever had. Def going into the rotation! I’m obsessed with your blog! It’s my go to site when I sit down to plan meals. So far every single thing has been a hit! We aren’t fans of cilantro but the rest of the recipe looks delicious & like a salad my hubby will enjoy too. I’m very lucky that he’s a salad eater from what friends have said, since theirs would never eat a salad as the entire meal. I love this salad so much! I could drink the dressing..
My 6-year-old girl and 8-year-old boy each take a turn making dinner every week. This salad is one of the favorites on their dinner nights because it’s so easy. My 6yo made it by herself last night. She left out the onions and used cooked chicken from the freezer. For the dressing she mixed ranch dressing with BBQ sauce and my kids actually liked it better that way. I still prefer the homemade dressing, but if my 6yo can make dinner without help I don’t mind the ranch kind! Thanks for another delicious and quick dinner! I am going to give it a try. I will report back when I defrost it. 🙂 I saw your recent recipe that mentioned that you can freeze buttermilk. I was thrilled to discover this bc we just don’t use buttermilk that much in our house. I was wondering how the mayo would do in this dressing in the freezer. We shall see. Thanks for all of your delicious recipes. Our family hasn’t met one yet that we didn’t love! We love this salad in our house. One of our fav meals. Do you think you could freeze the salad dressing? It makes more than we need and I find the dressing to be the most time consuming – yet the most delicious! It would be great to have on hand to quickly make the salad another night. Beth – well, you could definitely try freezing the dressing but I think the texture could get a little weird (thanks to all the dairy). Having said that, it’s always worth a try! This salad was soooo good! My husband asked if we can keep this dressing in the fridge at all times. It’s really great for dipping…our favorite thing to dip in it…celery! Thanks for another great recipe! I am a new reader, and I am so glad I found your site! I stumbled upon it while looking for creative salad ideas. This was so yummy! I’ve been bringing it to work for lunch, and all of my coworkers are jealous! This was phenomenal!! We couldn’t get enough! MMM. This salad was to die for good! I used romaine and spinach instead of romaine and iceberg. I also used tomatoes instead of red onion, since raw onion is a no-no in this house. The dressing was heaven. I am dreaming about it on your layered cornbread salad. I can’t wait to try that! Needless to say, dinner was a big hit! This was a hit with my family! I did not combine the chicken with the 2 cups of BBQ sauce, as I knew that would be too much BBQ flavor for my family. We loved the dressing! In it, I used a heaping 1/4 c Trader Joe’s eggless mayo & the same of plain Greek yogurt instead of 1 c. regular mayo. I didn’t have buttermilk, so just combined my skim milk with the vinegar first. Topped the whole salad with avocado and it was perfect! Thanks for another recipe for our rotation! I (along with everyone else on here!) love love loved this! Thank you so much for the wonderful recipes! Another home run from Mel’s Kitchen Cafe! Seriously. Sometimes, when I eat the stuff I prepared using your recipes, I can’t believe the food actually came from my kitchen … it tastes so good! This salad was easy (made the dressing the night before) and scrumptious. Thank you!! This is one of our favorite salads!! My husband devours it! Abby – is that a joke? Seriously, cause why are you leaving a comment like that if YOU haven’t tried it. Why do people comment when they haven’t tried it!!!! Only comment if you’ve tried it! OMG! This salad even on its own is absolutely delicious!! One of my partners favourite meals and he is a salad-hater!!! Had this tonight – it was so yummy! Will make it again for sure. Already passed this along to a few friends who also rave about it. LOVE, LOVE, LOVE this! And it makes me feel like I’m a nutritious person…I make a whole bunch and eat every day for lunch until it’s gone…then I sigh and wish for more. My husband prefers this salad dressing to Cafe Rio dressing (and he’s not huge on dressing, so he was skeptical at first). Huge fan of yours! Thanks for sharing the deliciousness! made this last night! so yummy! It was a great treat to be able to provide a nice cool meal (it was only 113 here yesterday). Everyone enjoyed it 🙂 the dressing is amazing! I was deliriously happy with the taste of this!!! YUM!!! I haven’t felt so great about something I made in ages. Thanks! We had it last night & I know it will now be in our regular rotation. You are brilliant! I LOVED the dressing. My favorite part of the salad! Just made this salad, and it was fabulous! It tastes very similar to a favorite restaurant salad–now I can stay home to eat it! Thanks for the recipe! Great! If you want “croutons” for a salad like this Fritos honey bbq spirals are really good! This was delicious! The recipe makes a TON Of dressing though. I had a lot left over. I also added avocado and cherry tomatoes to the salad and only used about 1/2 a cup of mayo and was VERY happy with the result! Will be making this again for sure! Good one Mel! My daughter ate 2 helpings and the baby even liked it. Easy to make too. Thank you! Hi Brandie – I just fixed the printable to include the dressing! I am excited to be putting this on our menu for one night in the next few weeks. One question though, when I print out the recipe it doesn’t include the dressing. Is this something your can fix or do I need to just “select Print” that part? Just wondering. Wonderful salad, I would have never thought to put bbq on a salad but it was amazing. Thanks Mel. I made this last night and my husband was freaking out saying it was the best thing he’d eaten in forever. Of course that made me feel like every other meal I’ve made was bad, but I have to agree with him that this salad was delicious! FYI, only the salad recipe comes up when you want to print it. Not the dressing. Just thought you’d like to know… I’m going to make this this week. Mel, This was fabulous!!! Yum! Thank you for sharing!!! For a slightly lighter and zestier dressing I replaced the 1 cup of mayo with 1/4 cup light mayo and 1/4 cup of lowfat plain yogurt. I’m not sure what the regular recipe is like, but it was so fabulous. My mouth was still loving it at the end!!! Yum! n82 – the dressing makes about 2 cups, give or take a little, and I have kept it in the refrigerator for up to two weeks with good results. How much does this dressing make and how long will it last in the fridge? Loved this tonight! The dressing is fantastic. Thanks. Thanks Mel! This was our dinner tonight and it was really yummy! The dressing has really amazing flavor. I will definitely make this again! This dressing is the bomb!! I made this salad last night, and took the leftovers to work. All my co workers loved it!! It reminds me of my fav BBQ chicken salad at Cheesecake Factory. We make this often. It is one of our favorites. Thanks for your great site. This salad was like a party for my taste buds. LOVED IT!!! That dressing…oh my, FAAAAAbulous! Thanks for the great recipe. This is my favorite dinner now. It fits the good for you, savory, fresh, and filling bill for my family. YUM!!! We have had this a dozen times in the last few months and we are not sick of it yet. I have not found a better way to cook my chicken either, thanks for the tip! Rachel – I’m thrilled this meal has become a staple for you! since i’m a carb addict, i’m going to throw this (minus the lettuce) on a potato. can’t wait. Wowza!! This was so delicious. We’ve got some dairy allergies in the family, so I substituted unsweetened almond milk and a little lemon juice for the milk and buttermilk in the dressing. It turned out so yummy I could eat it all by itself. Thanks for a recipe that I’ll be coming back to again and again and again. Thanks for the tip on how you pre cook your chicken. I was wondering, after you cook the chicken in the crockpot how long does it last in the refrigerator? And if you freeze it, whats the best way to reheat it. Thanks again for all your yummy recipe! Hi Danielle – I usually keep it in the refrigerator for up to three days but after that, I can kind of taste a funny after taste that isn’t very enticing. After freezing it, I usually thaw it in the refrigerator overnight before using it. If I forget to do that, I’ll gently thaw it in the microwave before using (or sometimes just throw it into a casserole or baked dish frozen since it will be going in the oven anyway). Yum, this was great! My husband and I both had seconds….of salad! I did a couple things to make it a little healthier, I used spring mix instead of romaine & iceberg and substituted greek yogurt for half the mayonnaise (and used oil olive mayo for the rest). Thanks for sharing this recipe! This salad was absolutely fabulous! I forgot to grab mayo so we just used ranch. My husband doesn’t much care for chicken but even he said “wow this is actually really good”. I will definately be making this again! I made this for dinner on Sunday night and it was outstanding! The dressing is a new favorite of mine. Thanks for sharing! That is one tasty looking salad! Thanks for the great recipe. The dressing was delicious. My three picky kids even ate it!! My husband would absolutely love this salad. I will definitely have to try it. The dressing sounds really tasty! This made my mouth was water when I saw it late at night last week. I made this for dinner a few nights ago and it didn’t disappoint!! So YUMMY, thanks! I made this tonight and we all loved it! Thank you!! Mel, I just made this and I wanted to let you know, it might just be my new favorite salad too! Usually when I eat salads I don’t get completely “full”, but I was “full” after this one. I will be making this a lot. Thanks! I always wonder why salad at home never tastes as good as at a restaurant. I will wonder no more! This was great. Thanks for sharing all of your deliciousness! I made this tonight for my husband and I and it was delicious! Wonderful idea with the bbq dressing! Made this tonight for the family andthey gobbled it. We have l o v e d every recipe from your site so far. Thank you for all the delicious family dinners! Made this tonight and it was A. MAZ. ING. Totally cured my preggo craving, for tonight at least 🙂 Thanks for sharing! You’re awesome! awesome meal! We added chopped red bell peppers and black olives to the salad, and since our chicken was chipolte flavored already from the meal before, we subbed some salsa and some sour cream for the bbq sauce in the dressing. As an afterthought, I think an avocado in the blender dressing would have been a perfect finish to the chipolte chicken salad version we had. Thank you, yet again!! Made this for dinner – i skipped the bbq sauce on the chicken though and just used the dressing – it was absolutely wonderful! Thanks for the recipe! I have lettuce that needs used up and I think this is the perfect thing to use it for. I even have all the ingredients, I think? Is white vinegar, just regular vinegar? I think it would be perfect with crunchy tortilla strips on top! Oh my I cannot wait to try this salad! Looks so delicious! Can’t wait to try this salad. The dressing sounds divine. Oh, that looks and sounds so wonderful! I have yet to find fresh cilantro in Taiwan and it’s sad thing because I LOVE it. I’m dying to have a bite of this. Delicious! I can’t wait to try this. It seems so springy. I’m over winter! I nearly licked the screen. This is my very favorite kind of salad. Ever. I like to crush up some of those ‘Food should taste good’ brand multi-grain tortilla style chips on top and add avocado. YUM! I was planning on making taco pizza for dinner tonight but this looks so much better! Plus if we have salad for dinner then I won’t feel so bad about making your sinful brown butter brownies! Can’t wait!!! Your salad looks wonderful! 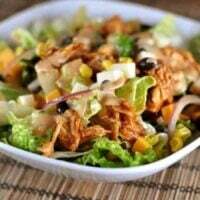 I love the BBQ Chicken Salad at Panera and this looks similar ~ can’t wait to give it a try! I am going to make that dressing tomorrow for lunch, sounds so yummy. I love homemade salads and dressing. This is a winner for sure! Thank you, thank you for the tip on how you cook your chicken! I don’t know why cooking stresses me out so much sometimes. Your great recipes and cooking tips go a long way to helping me feel more confident in my cooking and everything I have tried off of your website is delicious! this is right up my alley… very excited to make this one. Thank you! I am your biggest fan. Sounds like a great lunch in my near future! There is no better compliment to pay than to say, I’d eat this in a heartbeat. I love the classic BBQ chicken salad with ranch, but this salad with creamy BBQ Cilantro Lime Dressing sounds like it would be a knock out! YUM!! Panera has a great BBQ chicken salad but yours looks even better! I’m loving that Cilantro Lime Dressing! This looks so good. I’ve been thinking lately that I want to start “exploring” some salad recipes to get rid of just plain lettuce. My husband is not a big “stuff on salad” person but I am. Can’t wait to try this as my lunch soon! !